B - Two disclaimers: First, I had never seen Steven Sondheim's Sweeney Todd: The Demon Barber of Fleet Street on the stage, although the story was familiar to me. Second, I am not generally a fan of musicals, whether live or on film. With these facts in mind, I found Tim Burton's film adaptation of Sondheim's musical to be the director's most thoughtful, magnetic work since his superb 1990 gothic-suburban fable Edwards Scissorhands. 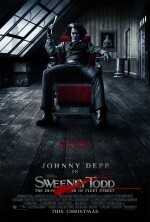 Whether Burton deserves the credit for the achievement of this new Sweeney Todd is debatable. The wide adoration lavished upon Sondheim's musical—from undiscriminating Broadway tourists and devotees of American music history alike—suggests that much of the film's depth is a product of the source material. What Burton doubtlessly brings to the tale is his studied eye for sumptuous, gloomy detail and the bittersweet poignancy he coaxes from his performers. Sweeney Todd is, admittedly, heavy on the bitter, and mostly bereft of sweet. It serves up a vision of human behavior that is easily the most brutal and bleak that Burton has ever dabbled in. The story is now familiar territory in the American cultural landscape. What Burton and screenwriter John Logan bring to the tale is a repulsive intimacy that would be extremely challenging to achieve on the stage. Burton keeps the focus on Sweeney and Mrs. Lovett, although he tugs the dreams and desires of all the principal characters into a knot of grimy despair. There is no chorus in the film, and the populace of its Dickensian England is more of a setting than a cast. The stifling, sooty, (barely) exaggerated horror of Sweeney's London renders the gruesome violence of the tale all the more believable. The lush Hammer Horror set pieces that lent Sleepy Hollow its patina of moldering nightmare have been toned down half a notch here, to masterful effect. For the first time in a long time, Burton achieves a remarkable resonance between story and setting. It's hard for me to judge musical numbers, given that I find the whole notion of singing actors to be distracting in film. It takes me about ten minutes for me to settle in and accept the affected reality of musicals, where characters readily burst into song. Perhaps due to Burton's familiar visual style—for which I have deep admiration and affection, if not always for its application—I found this transition easier to achieve in Sweeney Todd. The film has moments of positively operatic ferocity, but most of the music is relatively reserved. Some numbers are sung in solitude, plaintive declarations directed at the greasy London sky. Some songs are murmurings or matter-of-fact commentary directed to other characters, who are alternately oblivious or sprinkling in their own wordplay. I wouldn't characterize any of the music as remarkably infectious, but it has a magnificent personality all its own. Sondheim's lyrics are works of undeniable wit and density, with whiffs of Lewis Carroll and Tom Stoppard. For his part, Burton's staging of the numbers is often quite memorable, particularly for "The Worst Pies in London," "Epiphany," "A Little Priest," and "By the Sea". It's tempting to describe Sweeney Todd's characters as one-note, although static might be more apt. There's no development or evolution here. Judge Turpin's act of nearly satanic malevolence sets the characters on a collision course with one another, and the result cannot be anything but tragic. The story's complexity arises from the manner in which the characters' desires intersect, conflict, and pass each other by. Given this approach, the casting of Johnny Depp as Todd strikes me as a wise move. Depp's good looks, charisma, and familiarity amid such slightly askew period trappings serve to lend Todd some sympathy, when he is actually due very little. Depp plays Todd as a man filled to overflowing with rage and remorse and nothing else. He's bloodthirsty and assured when planning and perpetrating his murders, but stoop-shoulder and dead-eyed the rest of the time. Helena Bonham Carter isn't getting nearly enough attention for what I believe is the best performance in the film. Carter is too often cast for her distinctive looks, which are an admittedly compelling gestalt of chiseled, cherubic, and sinister. Her strongest performances—Fight Club and now Sweeney Todd—have both had a cocksure amorality, bedraggled and fiercely feminine. While Marla Singer was raw nihilism with a glimmer of romanticism, Mrs. Lovett is a far more convoluted and fascinating woman, at least in Burton's film. That she is a monster is no doubt, but like all the characters in Sweeney Todd, she has her own strain of naïveté. Incidentally, both Depp and Carter sing in the film, and they both do fine. Up until now I've stood outside the Sweeney Todd phenomenon, but it's easy to see why the musical is regarded as a compelling milestone in American theater. In bringing it to film, Burton emphasizes not just the tangible horror of cannibalism and spouting jugulars, but the underlying horror of humanity's depraved potential and fallibility. The music is not, strangely enough, front and center in the film, but neither does it feel obligatory. The filmmakers seem to recognize that the story is powerful in its own right, but that it also benefits immeasurably from the telling via Sondheim's music. I can't think of a better antidote to the cloying taste of the Christmas season than this gruesome, blood-drenched morsel, realized by a director who seems born to do so.